In anticipation of Sunday night's Golden Globes, we put some of last year's favorite red carpet looks to the test. Turns out, it's easy to get these star studded looks just by browsing the collection at Creative Contrast. We've got pieces that win in all categories. Take a look at how we've re-created some of last year's favorites. Debra Messing decided it was better to go big or stay stay home. She was right. We love how she stacked bracelet upon bracelet to create her red carpet look. We love the hair too! We can't wait to see what you'll wear on the red carpet this year. Get Debra Messings's Look: KENNETH JAY LANE Gold Alligator Stretch Bracelet, $159. ALEXIS BITTAR Gold Reverse Quilt Hinge Bangle in Gold , $221. ALEXIS BITTAR Gold Burnt Amber Lucite Crystal Mosaic Oval Rope Bangle, $330. ALEXIS BITTAR Miss Havisham Small Gold Molten Hematite Cuff Bracelet, $112.50. We'll be routing for Sandra Bullock this Sunday night when she's up for Best Picture for The Blind Side. Not simply because we love her as an actor but because we love her Southwest style. The actress owns a Southern BBQ joint in Texas and brought some spice to last year's Golden Globes with an arm full of turquoise. Get Sandra Bullock's Look: KENNETH JAY LANE Large Gold and Turquoise Cabochons Snake Ring, $175. KENNETH JAY LANE Antique Gold and Turquoise Sapphire Back Snake Ring, $108. KENNETH JAY LANE Antique Gold and Turquoise Dots Octopus Ring, $129. It's true that the Golden Globe after parties can get a little wild. 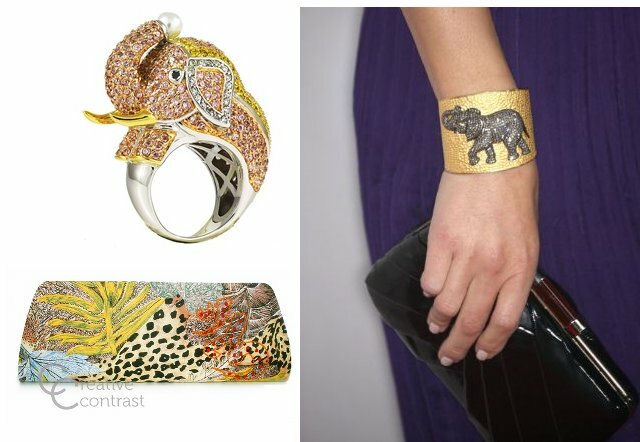 Maria Menounos brought her own wildlife to last year's NBC, Universal Pictures and Focus Features` official after party when she wore this elephant cuff bracelet. We can't help feeling all warm and fuzzy when we look at this little guy which is why we love these animal inspired accessories. Lions and tiger and bears, oh my! Get Maria Menounos' Look: NOIR Goldie the Elephant Cubic Zirconia Encrusted Pave Pink Ring, $170. SIR ALISTAIR RAI Jackie O Clutch with Animal Print, $135.